Season 4, Episode 15 - "End-A-Rooney"
The Rooney house is finally rebuilt and Karen can't wait to have the family reunite in Wisconsin. However, when exciting opportunities arise for each of the Rooney kids, their summer plans are suddenly thrown into jeopardy. Season 4, Episode 14 - "Voice-A-Rooney"
Liv undergoes vocal surgery and is unsure if she'll ever be able to sing again so Karen and Maddie call in reinforcements to help. Meanwhile, Parker and Val are surprised by their competition in the Mars Madness finals. Season 4, Episode 13 - "Sing It Live!! !-A-Rooney"
As the cast of "Sing it Live!!!" gets ready for a live televised show, a vocal injury threatens to ruin Liv's performance. "My Destiny," an original song performed by Dove Cameron, is featured. Season 4, Episode 12 - "Big Break-A-Rooney"
Season 4, Episode 11 - "Tiny House-A-Rooney"
When Maddie and Willow discover that one of their acquaintances is homeless, they set out to help him. Meanwhile, Karen gets discovered by a modeling agent, and Joey and Parker attempt to sneak into a movie. Season 4, Episode 10 - "Ex-A-Rooney"
When Maddie and Josh start hanging out again, Joey feels awkward by their rekindled friendship. Meanwhile, Parker and Val find themselves in a jam when competing for a coveted finalist spot in the Mars Madness competition. Season 4, Episode 9 - "Falcon-A-Rooney"
Joey's popularity at school is threatened when an old nemesis from Wisconsin returns and Maddie feels the need to keep a close eye on Parker's new friend. Season 4, Episode 8 - "Roll Model-A-Rooney"
Liv and her fellow female co-stars of "Sing It Louder!!" attempt to break the stereotype that boys are better than girls at ‘boy stuff' by organizing a woodblock derby race against the boys. Meanwhile, Maddie and Willow take part in a challenge at their local restaurant which has only been won by men before. Season 4, Episode 7 - "Standup-a-Rooney"
Joey is nervous when he's invited to perform stand-up comedy at a local restaurant. Parker finds himself in a predicament when he isn't sure if he's asked his fellow classmate to be his partner in a science competition or his date to a school dance. Season 4, Episode 6 - "Cali Christmas-A-Rooney"
Maddie is upset that she can't be in Wisconsin for Christmas and to cheer her up, Liv plans an incredible surprise. Meanwhile, Joey participates in a Mr. North Pole Santa Claus pageant against an old foe and Parker tries to teach Ruby the wonders of a Snow Day. Season 4, Episode 5 - "Slumber Party-A-Rooney"
Season 4, Episode 4 - "Sing It Louder! !-A-Rooney"
When Liv's new show is in danger of being cancelled because they can't find the right cast, Liv helps by searching for the perfect star. Parker concocts a plan to take Joey down, and his new Falcon persona, by having Joey test-drive a dangerous invention. Season 4, Episode 3 - "Scare-A-Rooney"
Season 4, Episode 2 - "Linda & Heather-A-Rooney"
Liv lands a small part on the hit show "Linda and Heather," but her role turns out to be bigger than she expected. Meanwhile, Joey deals with relationship woes. Season 4, Episode 1 - "Sorta Sisters-A-Rooney"
Season 4 begins with Liv, Maddie and the rest of the Rooney family excited to start their new life in California. As the school year begins, the Rooney's cousin Ruby returns home from summer camp and is thrilled to have "sort of" siblings. Meanwhile, Joey and Parker attend their new science and technology school but it's nothing like what they expected. Season 3, Episode 20 - "Californi-A-Rooney"
Liv and Maddie getting into a big disagreement while trying to figure out if they will be together for the next four years or be going their separate ways. Season 3, Episode 19 - "Skyvolt-A-Rooney"
Liv must choose between moving or staying in Wisconsin with her sister when ``Voltage'' relocates to Los Angeles. Season 3, Episode 18 - "Friend-A-Rooney"
Liv is not too happy when Joey lands a part on "Voltage." Meanwhile, when Karen finds out that Andie's dad, Mr. Bustamante, disapproves of Dump Truck, they team up to change his mind. Season 3, Episode 17 - "Choose-A-Rooney"
With Diggie's return, Maddie is torn between him and Josh. Meanwhile, Liv is asked to plan a wedding in under a week when Gemma and Johnny Nimbus decide to get married. Season 3, Episode 16 - "Scoop-a-Rooney"
Season 3, Episode 15 - "Home-Run-a-Rooney"
Maddie and Josh go on their first date. Liv and Holden try to help Parker pass his show choir class. Season 3, Episode 14 - "Dream-a-Rooney"
"Voltage" is taking up all of Liv's time, but when The Dream is asked to reunite for a fundraiser, Liv is determined to make it happen. Meanwhile, Maddie tries to figure out where to go to college. Season 3, Episode 13 - "Vive-La-Rooney"
When Liv needs to learn French for an upcoming interview, her mom decides to immerse her in the language and culture. Meanwhile, Maddie is thinking about dating again. Season 3, Episode 12 - "Secret-Admirer-a-Rooney"
Joey and Parker hold strong beliefs that the Voltage set is haunted; Josh finds an excuse to spend time with Maddie. Season 3, Episode 11 - "Coach-a-Rooney"
A new coach arrives to take charge of the girls' basketball team and immediately butts heads with Maddie. Meanwhile, when Liv agrees to help Parker with his art project, her date with Holden takes an unexpected turn. Season 3, Episode 10 - "Ridgewood-a-Rooney"
Season 3, Episode 9 - "Joy to-a-Rooney"
Liv invites some of the crew home for Christmas; to her surprise, she learns mom never used to cook the holiday dinner and decides to cook the festive feast herself. Season 3, Episode 8 - "Ask Her More-a-Rooney"
When an interviewer focuses more on Liv's appearance than her acting, she enlists the help of her friend Kristen Bell in hopes of changing the conversation; Maddie has to hunt down a lost library book. Season 3, Episode 7 - "Meatball-a-Rooney"
Willow earns a scholarship that Maddie wanted and the two have a huge fight; Joey accidentally breaks Liv's toe and makes things worse when he tries to help her. Season 3, Episode 6 - "Grandma-a-Rooney"
Grandma Janice shows up to present Liv with an award, but Liv begins to suspect that something isn't right. Meanwhile, Joey invites three girls over to watch the "Lover's Comet." Season 3, Episode 5 - "Cowbell-a-Rooney"
Liv tries to help her new co-star feel more comfortable, so she starts introducing him to her friends. Season 3, Episode 4 - "Haunt-a-Rooney"
Maddie and Willow prepare for "Senior Scare," a Ridgewood tradition when high school seniors scare middle schoolers. Meanwhile, Liv falls into a precarious predicament with a photographer, and gets fans Cyd and Shelby ("Best Friends Whenever") to help pull off a flash mob to create a diversion. Season 3, Episode 3 - "Co-star-a-Rooney"
Casting is underway for Liv's co-star in "Voltage" and some familiar faces show up for the auditions. Meanwhile, Karen arranges a "cleansing ceremony" for Maddie to help her let go of her feelings for Diggie. Season 3, Episode 2 - "Voltage-a-Rooney"
Maddie enlists Liv's help to build a giant Paulie Porcupine head for the Homecoming parade, but Joey and Parker accidentally destroy it while playing around with a stunt-prop from Liv's TV show, "Voltage.". Season 3, Episode 1 - "Continued-a-Rooney"
While Joey and Maddie try to catch Diggie before he departs for Australia, Liv covers for Maddie at home. But when Diggie shows up at the Rooney house, chaos ensues, reminding Parker of his favorite soap opera drama. Meanwhile, Liv gets a call from her manager telling her she landed a coveted role in a new TV show "Voltage.". Season 2, Episode 24 - "Champ-a-Rooney"
Before Diggie leaves for Australia, he needs to find Maddie and tell her how he feels. Meanwhile, Parker, Reggie and Evan vow to stay on the couch until the new season of "Linda and Heather.". Season 2, Episode 23 - "SPARF-a-Rooney"
Maddie and Diggie try to "out-fun" each other at a local music festival as Liv tries to help Andie get over her breakup. Season 2, Episode 22 - "Frame-a-Rooney"
Ridgewood's mascot has been vandalized, and the Rooney's all become suspects. Meanwhile, Parker has the day off from school and gets into trouble at home with Reggie. Season 2, Episode 21 - "Triangle-a-Rooney"
Season 2, Episode 20 - "Video-a-Rooney"
Liv and her band mates are stumped and can't agree on a theme for their new music video. They enlist Parker to shoot the video with his new camera and Diggie enthusiastically signs on to join his crew. Season 2, Episode 19 - "Band-a-Rooney"
Liv rallies together a band, The Dream, to compete in the upcoming Stevens Point Battle of the Bands contest. Joey and Artie form a band too, but they can't seem to agree on anything. Season 2, Episode 18 - "Flugelball-a-Rooney"
Diggie returns from Tundrabania, but he and Maddie have trouble reconnecting. Joey tries to solidify his relationship with Diggie through the Tundrabanian sport of Flugelball. Meanwhile, Parker attempts to teach his new unlikely friend Dump Truck how to ride a bike. Season 2, Episode 17 - "Prom-a-Rooney"
Liv realizes she has a crush on Holden, but Andie asks him to prom before Liv can. With Diggie away, Karen arranges for Rooney cousin Craig to take Maddie to prom but when he arrives they realize that he has reinvented himself into an illusionist named Kraghh the Insidious. Season 2, Episode 16 - "Cook-a-Rooney"
To raise her grade in Mr. Clodfelter's home economics class, Maddie must win the Plate Off and defeat the class master chef, Artie. Meanwhile, Joey convinces Pete to sponsor his made-up clubs at school. Season 2, Episode 15 - "Repeat-a-Rooney"
Liv must finish a 6th-grade project to avoid taking summer school. Joey gets Maddie to teach him how to be a jock to impress a girl. Season 2, Episode 14 - "Neighbors-a-Rooney"
During a neighborly feud with the Dippledorfs, Liv rekindles an old friendship with Holden Dippledorf. Meanwhile, Joey becomes fascinated with a new member he meets at his weekly Intergalactic Council meeting. Season 2, Episode 13 - "Gift-a-Rooney"
Liv meddles with Diggie's "meet-a-versary" gift for Maddie and Parker concocts a new face cream for Karen. Season 2, Episode 12 - "Muffler-a-Rooney"
Liv is filming the "sequel" to the muffler commercial she did when she was six, but this time it's with her long-lost best-friend, Shayna. Meanwhile, Maddie is nervous about her knee as she prepares for her first game back. Season 2, Episode 11 - "Detention-a-Rooney"
Season 2, Episode 10 - "Rate-a-Rooney"
Liv, Maddie and their friends confront a fellow student who gives them numeric ratings based on their looks. Season 2, Episode 9 - "Upcycle-a-Rooney"
Season 2, Episode 8 - "Bro-Cave-a-Rooney"
Joey and Parker have finally reached the point of no escape and have to clean their inexplicable filthy room. When they try to trick Liv and Maddie into cleaning it for them, the girls fight back with an even better ruse. Season 2, Episode 7 - "New Year's Eve-a-Rooney"
Liv co-hosts and performs at a New Year's Eve party, and when a secret is revealed on live TV, it causes Maddie to question her long distance relationship with Diggie. Season 2, Episode 6 - "Hoops-a-Rooney"
When Liv is offered the lead in a basketball movie, Maddie and Willow volunteer to transform her from a clumsy athlete to a basketball pro. Season 2, Episode 5 - "Match-a-Rooney"
Guest Starring Jessica Marie Garcia as Willow, Jimmy Bellinger as Artie, Herbie Jackson as Reggie and Jaida-Iman Benjamin as Emily. Season 2, Episode 4 - "Kathy Kan-a-Rooney"
Liv becomes quick friends with Korean popstar and international teen sensation Kathy Kan when she comes to the states to study the actress for the Korean version of her hit show, "Sing It Loud.". Season 2, Episode 3 - "Helgaween-a-Rooney"
The Rooney's Halloween celebration takes an unexpected turn when a magic amulet turns twins Liv and Maddie into triplets, and their sister is the frightening Helga. Meanwhile, Joey and Parker use the amulet to clone themselves. Season 2, Episode 2 - "Pottery-a-Rooney"
Season 2, Episode 1 - "Premiere-a-Rooney"
In the season two premiere, the family is getting ready to compete against one another in the Wisconsin Cheddar-Brat Fest. Ironically, Liv's premiere of "Space Werewolves" is on the same night. Season 1, Episode 21 - "Space-Werewolf-a-Rooney"
To prove to the skeptics that she is meant to star in "Space Warewolves," Liv agrees to do all her own stunts, not realizing exactly how complicated they are. Season 1, Episode 20 - "Song-a-Rooney"
Liv's new music team takes a huge step in the wrong direction, causing her latest single to be a viral hit for all the wrong reasons. Season 1, Episode 19 - "BFF-a-Rooney"
Maddie is jealous when Liv's best friend from Hollywood, South, comes to visit and flirts with Diggie. Season 1, Episode 18 - "Flashback-a-Rooney"
Maddie is anxiously awaiting the arrival of a letter from the Junior Olympics that will tell her if she's been invited to try out for the basketball team. Season 1, Episode 17 - "Howl-a-Rooney"
Liv is told that the coveted role of Tristan in "Space Werewolves" has been narrowed down to herself and two other famous actors. Season 1, Episode 16 - "Shoe-a-Rooney"
In an effort to help Maddie bring out her "girly side," Liv gives her a pair of the most comfortable high heels ever made. Season 1, Episode 15 - "Moms-a-Rooney"
Maddie and Karen take part in a historical society's annual mother-daughter weekend of pioneer living. Season 1, Episode 14 - "Slump-a-Rooney"
Season 1, Episode 13 - "Move-a-Rooney"
The kids mistakenly believe that they are moving. Season 1, Episode 12 - "Dump-a-Rooney"
Maddie and Pete sign up to play in a basketball tournament. Season 1, Episode 11 - "Switch-a-Rooney"
When Liv is up for a big sci-fi movie role and Maddie has to take her driver's test, the girls switch places for the day to help each other out. Season 1, Episode 10 - "Fa-la-la-a-Rooney"
Liv sings a duet with a 9-year-old wannabe singer at the local holiday show. Meanwhile, Pete and Maddie decorate the town's Christmas tree; and Parker interferes with Joey's holiday get-rich-quick scheme. Season 1, Episode 9 - "Sweet 16-a-Rooney"
Karen throws Maddie a curveball about the day she was born, and she and Liv realize planning their sweet 16 party together may be more complicated than expected. Season 1, Episode 8 - "Brain-a-Rooney"
Liv convinces Joey to let her join his Brain Olympics team, even though he doesn't think she's smart enough - and she's set on proving him wrong. Season 1, Episode 7 - "Dodge-a-Rooney"
When Liv decides to volunteer at the senior center where Maddie works, chaos ensues and the seniors get the girls involved in a rowdy game of dodge ball to claim their turf. Season 1, Episode 6 - "Skate-a-Rooney"
Liv wants to back out of being a celebrity judge at a skateboarding competition after her boyfriend, a skateboarding pro in town for the competition, breaks up with her via text. Meanwhile, Joey and Parker are ecstatic when they meet a masked skateboarding pro who is famous for his massive wipeouts. Season 1, Episode 5 - "Kang-a-Rooney"
When Joey is too nervous to talk to a girl he likes, Maddie decides the best place for him to practice talking to girls is at the high school dance - when everyone is in costume. Meanwhile, Parker booby-traps the house to protect one of the family's most prized Halloween decorations from being stolen. Season 1, Episode 4 - "Steal-a-Rooney"
After Liv has a difficult time making friends at school, Maddie steps in to help. However, when Liv discovers she was set up and didn't make her new friend on her own, she ignores Maddie's warnings and instead befriends a girl known for causing trouble. Meanwhile, Joey is miserable at the new job he has accepted in order to pay back his parents for a hi-tech cell phone. Season 1, Episode 3 - "Sleep-a-Rooney"
After Liv realizes just how much Parker has grown up while she was away, she volunteers to supervise his sleepover in hopes of reconnecting with him. But when all her activities backfire and start to embarrass Parker in front of his friends, Liv has to up her game in order to impress her little brother. Meanwhile, Maddie and Willow work on a school project, and Joey and Pete go on a road trip to the Pastrami Palace that leads to a wild night of fun. Season 1, Episode 2 - "Team-a-Rooney"
Maddie is named captain of the girls' basketball team just as the school principal announces he is cutting funding for the program. Meanwhile, Parker and Joey have to find tarantulas that escaped after Parker brought them home from school, before their parents find out. 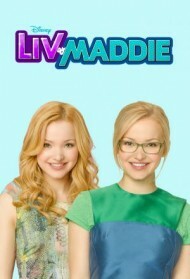 Season 1, Episode 1 - "Twin-a-Rooney"
Twin sisters Liv and Maddie finally reunite when Liv returns to Wisconsin after spending the last four years starring in a hit musical television show in Hollywood. The Rooney sisters quickly realize their polar opposite personalities put their unbreakable twin bond to the test. While their parents play referee between Liv, a cool, confident, social butterfly who loves to sing, and Maddie, a smart, athletic, high school basketball star who opts for high tops over high heels, brothers Joey and Parker seize the opportunity to capitalize on the chaos and get away with as much as they can.